Both production and playback of the video don’t require special technology or equipment, which means that you can watch any movie in 3D. i3DG is a playful analog extension to an iPhone or an iPodTouch, converting its 2D display into a layered 3D view. 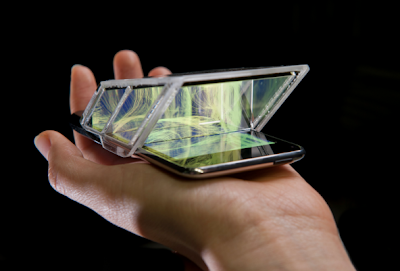 Using the old technique of placing a half-silvered mirror at a 45-degree angle in front of an image, in a new context, the project extends upon 3D displays and iPhones. As a peripheral gadget, i3DG can support a wide range of different applications, from 3D videos and animations to accelerometer-based games. There is no speculation when this will be out or how much would it cost.